Since I started working full time a few weeks ago, I'm looking for dinner ideas that are quick to put together, now more than ever. Some shortcuts I made from the original recipe included using a good store bought salsa verde salsa. I also roasted some bone-in chicken breasts over the weekend which I cooled and shredded beforehand to save me time on busy weeknights. Alternatively, you could even pick up a rotisserie chicken from the store and de-bone it too. But the one thing I didn't cut corners on were the tortilla strips. I think frying corn tortillas really makes a difference in the final texture of the dish. You get a slightly crispy and slightly soft result. And because corn tortillas are somewhat soft before frying, it's still able to soak up the flavors from the seasoning and salsa. I don't recommend using store bought tortilla chips - they're just too hard, thin and won't absorb all the flavor of the dish. 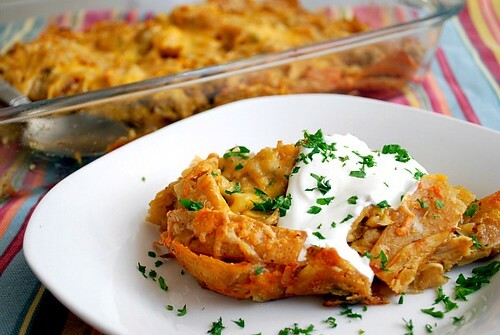 Overall, this dish is similar to a Mexican lasagna in which tortillas are used in place of noodles. However, I like how quickly this recipe came together, even on a busy weeknight. Don't forget to top with sour cream and serve with extra salsa! In a large skillet, heat oil to 350º F. Fry a handful of tortilla strips at a time until golden brown and crisp. Transfer the tortilla strips to a paper towel lined plate to drain excess oil. Continue with the remaining tortilla strips and fry in batches. Alternatively, if you have a deep fryer, you can fry batches of tortilla strips and drain on paper towels. Set tortilla strips aside. If using a skillet, carefully pour out the all the oil but reserve 1 tablespoon for sautéing. Return the skillet over a medium high heat with the reserved tablespoon of oil. When hot, add the onion and sauté until softened. Add the chicken and spices, stirring to combine. Add the stock and allow the liquid to reduce by half. Once reduced, transfer the mixture to a large bowl. Add the salsa and 1 1/2 cups cheese, stirring to combine. Next, add the fried tortilla strips and toss until fully incorporated and the tortilla strips have slightly softened. Transfer the mixture to a lightly greased 9x13 baking dish. Sprinkle remaining 1/2 cup of cheese over the top and bake uncovered in the preheated oven for 15-20 minutes or until top has lightly browned and cheese and melted. Serve with crema/sour cream, chopped cilantro, and remaining salsa if desired. YUM! I like the simplicity of easy meals now when I'm tired after a day's work. It's not easy to work a full day, and then cook. 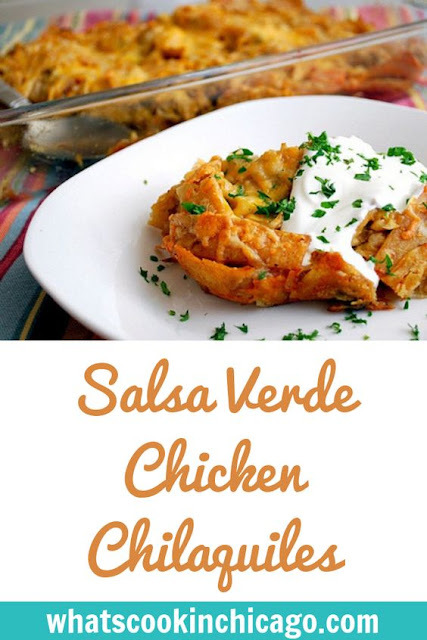 I have been wanting to make chilaquiles and I'm adding this to my menu for next week!! Can't wait!